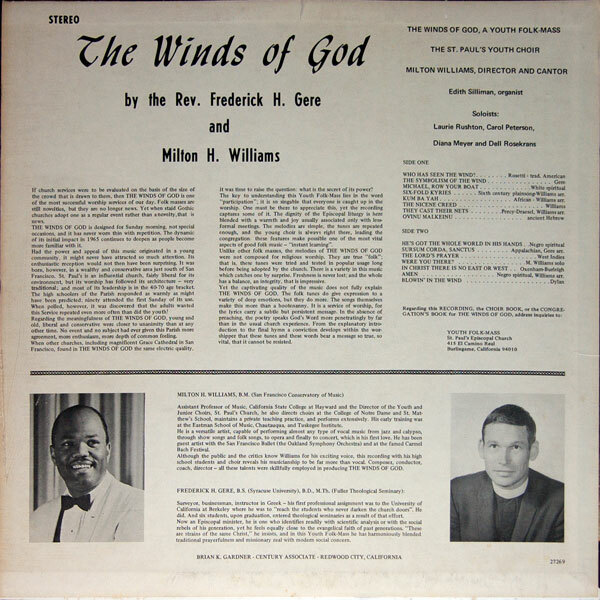 The Filioque and the "Field Hands"
Last year this blog featured Frederick Gere and Milton Williams’ The Winds of God, which was one of the earliest Episcopal “folk Masses” produced. 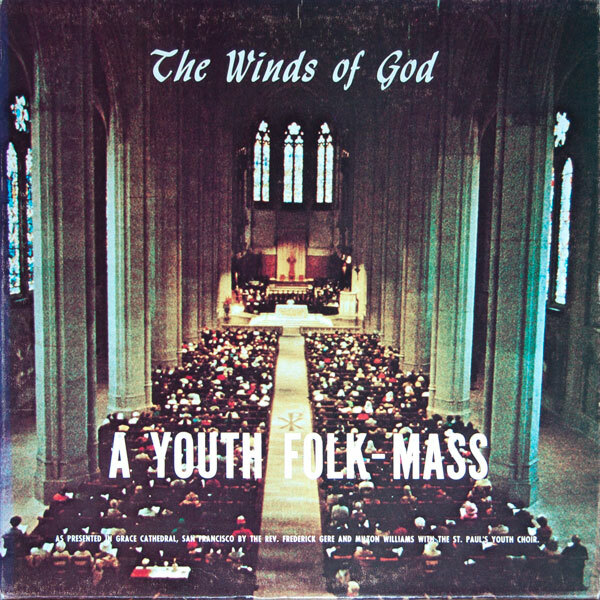 Attempting to break out of the traditional Episcopal mould of music, the folk Mass featured several types of music. One of them was the Nicene Creed, where choir director Milton Williams sang it antiphonally with the choir responding. Antiphonal music isn’t a novelty in the Anglican world, but the style is. Rather than drawing from the English tradition, Williams turned to an African-American style. It had its roots in slavery and agricultural work; the rhythmic music helped to ease the hard tedium of working in the fields in the hot South. It appears in compositions such as Scott Joplin’s Treemonisha (which I highly recommend you see if you get the chance). The “field hands” Williams had to work with were the youth of St. Paul’s Episcopal Church in Burlingame, CA. Although the result is quite charming, I’m sure that Williams got a good laugh at the business of having a largely white, middle class choir singing in a style which had been (and probably still was at the time) sung by poor black people picking cotton. And, of course, the Nicene Creed sung included the “filoque” clause, which has created such a headache these days in the Anglican-Episcopal world. It’s been a long time since this was recorded, but some more contemporary observations are in order. The first is a question: how many of these fine Episcopal youth “stayed on the plantation” after the convulsions of the 1960’s and 1970’s turned into the church’s first major shedding of membership? The second is that, during the second shedding of membership, the orthodox African provinces came and helped give cover to the “Anglican Revolt”. The Africans also found out that some of the “field hands” they took on weren’t as amenable to oversight as expected, which only shows that some people are better at dishing it out than taking it. You would enjoy it if you could ever get to Toronto on New Year’s Eve: there is a Midnight Mass at St. Michael’s on St. Clair Avenue, and the Lord’s prayer is sung by my friend Joyce Britain, the Jamaican-Canadian soprano. (She is most famous for her Shubert lieder, but apparently she is one of the two world’s experts, of differing opinions, on the Lord’s Prayer.) Bells and smells. Bed-time stories at 10:30 and sleep-over with child-care for children. Great break fast from four or five onward. The Congregation is about 1/3 black, 2/3rds white, and I joke not altogether inaccurately with Joyce that they all get there together on the number 5 bus through Forest Hill, both the owners and the cleaners of Forest Hill. She replies to me, with full accuracy, that the Congregation also includes the Jamaican-Canadian Greene, Jones and Brittain families, who went from rich to very rich — and who are the backbone of the Ghanaian education system, such as it is — by investing in their fellow congregants, the Rogers and Bassett familes (broadcasting and press),, when Rogers was a struggling young radio inventor and Bassett the elder had not yet discovered television. The last time I was in Toronto, I was attending to this. What did you think of them? How do you think they will handle it as more and more of their inspiring folklore comes up against real world fact? I’ve always been impressed by the people in our Caribbean congregations, they’re a pretty entrepreneurial group. In fact, I came to the conclusion that they (and their families) have accomplished more in 25 years in this country than their Anglo counterparts have done in 250. Parenthetically, I hope we can become friends. I came across you in the course of my study of Chinese, and immediately found you attractive because your work in China had at least some parallel with the 14 years I spent building the first 400 coin laundries in Japan. Out of interest in China I signed on to your excellent newsletter — and first thing I get in the mail is your, sorry, I’ll be as judicious as possible, silly remarks about my friend the excellent economist Paul Krugman. Rather than laughing it off I allowed it to annoy me, and perhaps replied petulantly. It’s clear that we agree about some things and disagree about others. Can we get past the disagreements? P.S. On Caribbeans, I think it’s a pity that the excellent General Powell, another of Jamaican extraction, could not have been President instead of the younger Bushlet. “I think he means supine,” was the good Communist professor Angela Davis’s dry remark. As my Latin teacher back in Palm Beach used to say, we can give it the old college try. As you can see, I started out a “preppy” Anglican but went another way, which I detail here. I have a very secular cousin who a) has Jewish roots and practices them from time to time, b) is successful in the financial industry in NYC, and c) lives in the same town as Paul Krugman. She doesn’t like him either. Maybe it’s a family thing, we need all of the “ties that bind” we can get. I think that everything Krugman has written about China in the last three months has been quite stupid — and I have told him so. All this stuff about “only* 7% growth being a sudden disaster is simply Chicken Little looking at the sky, seems to me. That transition is now cutting in, with the obvious results. Paul, quite to my surprise, had the same silly response as most of the rest of academia and all of the business press. On China it seems to me they still have a Carnation Revolution to come, but while Salazar could set up Caetano and the royal family as covers for a transition into a social democratic Europe, China can’t really use either Japan or the Chiang family in the same way. My experience with the Chinese informs me that most Americans at least are a)basically incapable of understanding the way the Chinese operate and b)driven by fear that the country will overtake the U.S.. The latter fear is justified, largely because the world is ours to lose, and lately we’ve been doing a good job of losing it. I think the Chinese will get “there” but “there” won’t be when we’d like it to be and the “there” won’t be what we think it should be. We pant for the Chinese to adopt “democratic” principles but those countries which have tried to adopt them too quickly have laid an egg doing so (Russia, Egypt, and of course China itself after the Double Tenth). And of course we overlook some serious present deficiencies in our own system. To a large extent our own system has become a method by which those with the money throw a lot of it at every election cycle in the hope that real men and women of the people don’t get to the top, and “validating” themselves in the process. It’s never easy transitioning from one kind of economy to another. But I think the Chinese will figure it out. Agreed on all your points. Passing the United States economically is not that easy to do, although China’s total product will certainly pass America’s total product some time this century. Catching up is made easier by having the American model to follow. Advanced hyper-industrialism doesn’t have any blueprints out there yet. I was intimately involved with the Japanese slow-down of the 1980s because from 1973 on I taught professsional interpreting at Yotsuya’s Nichi-Bei Kaiwa Gakuin (Japanese-American Conversation Institute) and then after it ws founded in 1978 I taught a course in American Constitution at their more advanced School of International Studies. In the first I met to staff people across the Keidanren, while in the latter I met their bosses and their bosses’ successors being groomed: these were people who could never confess to taking English conversation classes, and who in any event speak English very very well, but for whom a chance read, mark, and fight about politics and history was a sensible learning experience. My impression is that Japan has reached a reasonable stasis for the next couple of twenty-year generations, but will be able to look after its aging population quite well. Singapore is ver-ree interesting, and I often kick myself for turning down a job to be, literally “like Alvin Toffler” they said, to their planning people. Al and Heidi are friends of Susie’s and mine, though we disagree with them on practically everything, but I had then, and have now, nothing to tell the Singaporeans. Wey-yull, I can straighten them out a good deal about coin laundries maybe, but… They are very very bright, very tough and realistic, and they know they face terrific problems. On China I would very much like to hear anything you have to say about suburbanization. If you got my Twitter messages the other day you will know that I am a solid admirer of “Big Bill” Levitt, the creator of the Levittowns of Long Island and Pennsylvania after WWII. There wasn’t enough space on Twitter to tell you one of my favourite things about Big Bill: The word “ticky-tacky” is his invention, not Joannie Mitchell’s, though both he in his critical speeches at first and she in her song were referring to exactly the same piece of land, the slovenly little huts that litter the highway between San Francisco’s airport and the city. Mitchell is in fact a very bright lady, from here in Toronto, and I think it is highly likely that she knew of Levitt and his good work. The physics and biology that appear in her songs here and there are also accurate and up to date. The housing authority of a major Chinese Province offered me a quite senior job in the building of their incipient suburbs three years ago, and I was about to take it, until I realized the amount of corruption, with the dangers that that involves for foreign employees, that was built into their operation. “The 950” is a Chinese policy-makers’ term for the two-thirds of the people who are still outside the Deng Xiao Ping revolution, and at first blush there is a resemblance between the six million boys coming back from Europe to the GI Bill and the post-war boom in 1945 on the one hand, and the children of The 950 who will become urban in the next 20 years..Still, much as I enjoy Houston and admire Levitt, i can’t see those models being transferable. Japan is an interesting place; they have two “lost decades” under their belt, unfavourable birth rate and no idea of using immigration to compensate for it, and yet they’re still a prosperous society with a significant place in the world. Such conditions would drive Americans batty, which explains some of the crepe-hanging we see re Japan here. If the Japanese won’t get too excited about territorial claims and their hoisting the rising sun flag over their naval vessels, they will go on as they have. Although, as you could tell, I am not enamoured at the ideas of many of our urban dreamers, I don’t think that China has the people/land ratio to sustain the single family dwellings common in this country. OTOH I don’t see just going on with high rises, Soviet style. Perhaps a middle ground can be struck. Your steering clear of the corruption is a good idea. That’s one thing that has changed since I was in China, and not for the better. Apologies for misfiling you as Dan. My bad. Next PostNext Justin Welby's "Drunk Man" Needs to Sober Up. So Does Justin Welby.